Recently, I have been exploring new ways of integrating primary source analysis and discussion in the social studies classroom. In my Advanced Placement European History course, we constantly read, annotate, and analyze primary source documents to help the students better understand the major trends and paradigm shifts in European thought. I noticed that things began to get a bit stale in our normal classroom discussions, and I wanted to attempt a lesson that would both reinvigorate the conversation, while continuing to assess all students on their comprehension of the material. My solution came in the form of a wonderful professional development offered by the instructional coaches at Randolph High School. 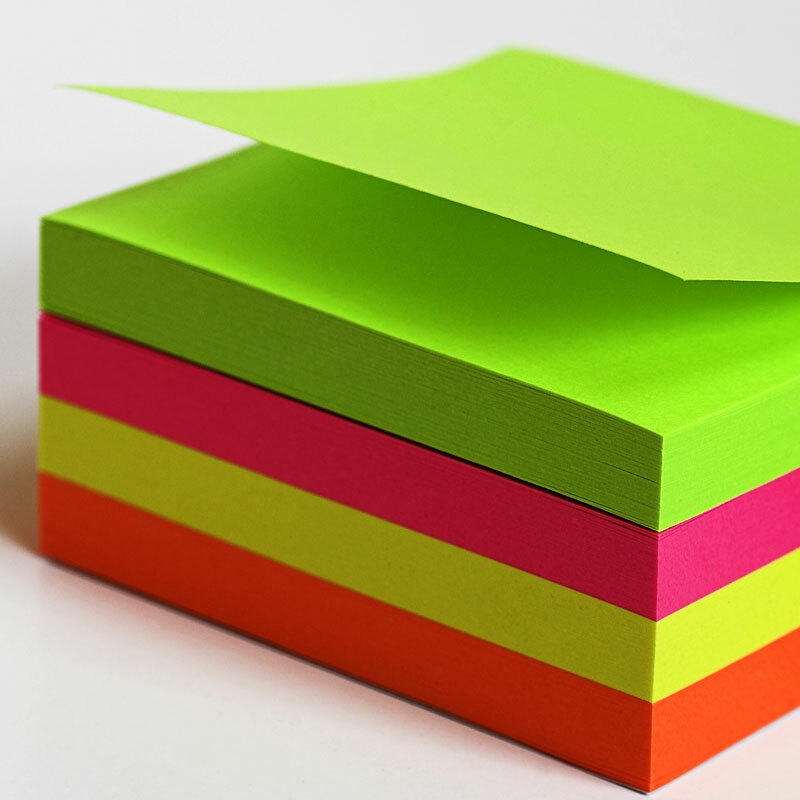 At a recent workshop, the coaches introduced ways to use Post-It notes of all shapes and sizes in a variety of different classroom activities. This “Post-It Pandemonium” is entirely student-centered, and provides easy ways for teachers to assess progress and comprehension while keeping students engaged in the lesson. 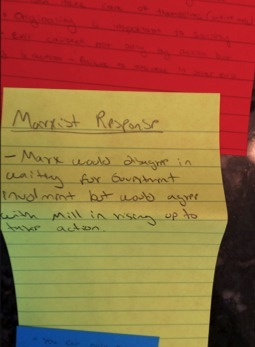 In order to apply these Post-It activities in my AP European History course, I designed a discussion-based lesson centered on the European philosophers Karl Marx and John Stuart Mill. For the lesson, students were attempting to evaluate the differing opinions of the two philosophers regarding individuality and community in nineteenth-century Europe. In preparation for this lesson, students needed to read and annotate a primary source packet with documents from both philosophers, as well as a variety of different critiques to their positions. Upon arriving to the class, students were divided into groups of three, and given a large Post-It note. Half of the groups were assigned to be experts on Marx, and the other half of the students focused on Mill’s theories of Utilitarianism. Students then had time to summarize their philosopher’s position regarding individuality on the Post-It note, incorporating evidence from the text. After placing these large Post-It notes on the board, a representative from each group chose a Post-It from the opposing philosopher, and, on a separate, smaller Post-It, had to write how their philosopher would respond to the ideas written on the original note. During this time, I circulated the room, and was extremely impressed with the high level of discussion occurring within each group. The students worked diligently to assume the role of their philosopher, and to justify their beliefs with textual evidence. After placing their philosopher’s rebuttal on the board, I decided to add one last twist to the lesson. After briefly discussing the initial analysis with all students, I gave each group a critique of their original philosopher from a nineteenth-century intellectual (i.e. Charles Darwin, Charles Dickens, Pope Leo XIII). Students then had to read the primary source from their critic, and, on an even smaller Post-It note, write how this critic would respond to the writings of their original philosopher. 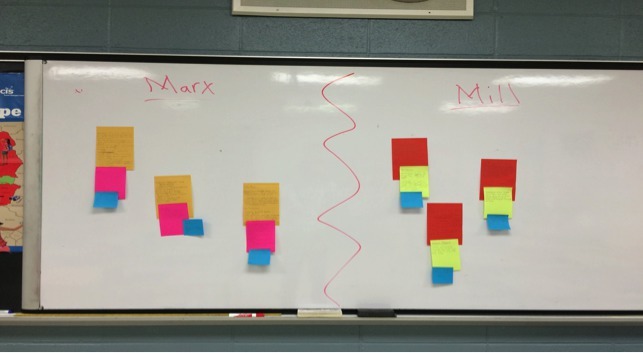 When the students placed their final products on the board, they had a chain of Post-It notes analyzing their original philosopher’s beliefs, a response from either Marx or Mill, and a critique from nineteenth-century society. We ended class with a brief discussion, peppering in any material the students may have missed during their small-group discussion. Based on the exit tickets from the class, students were not only able to meet the lesson’s objectives, but they appeared to have a fun time along the way. 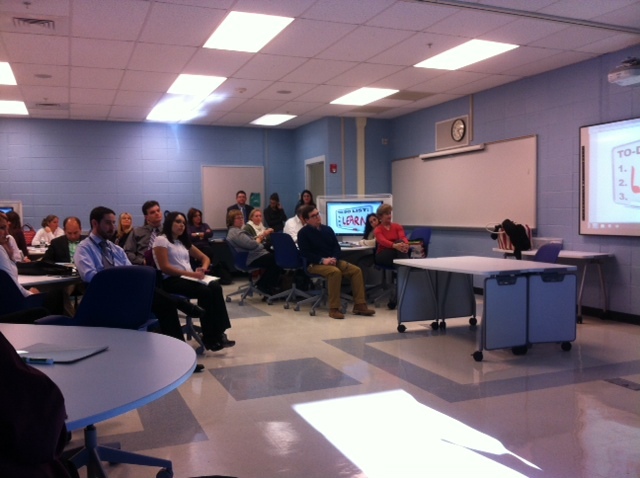 As I circulated the room, I found myself engaged in the small-group discussions, and was able to interact with students individually. Overall, I found that incorporating Post-Its into my classroom discussion was a simple and engaging way of assessing student learning, and I would definitely plan these activities into future lessons in the social studies classroom. Our school district is fortunate to be part of a new, exciting organization created by the State of New Jersey’s Office of School Innovation. Called innovateNJ, the initial community consists of 10 like-minded school districts working together “in ways that produce replicable and adaptable innovative practices.” It’s exciting to be a part of a community of fellow educators willing to collaborate about next-generation instructional practices. Personally, my PLN has grown tremendously since joining the organization and I look forward to what the future holds. 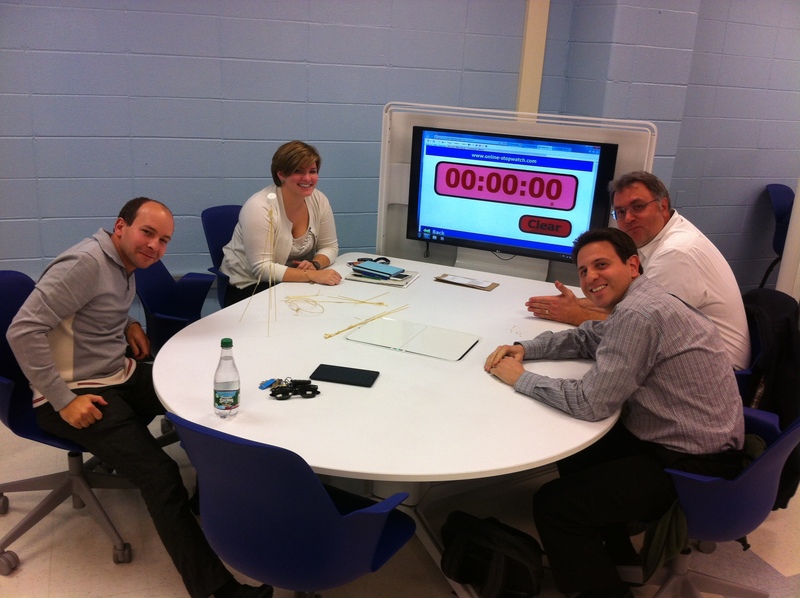 At 8:00PM EST tomorrow, November 20th, the innovateNJ community will be hosting their first twitter chat about innovation in schools. 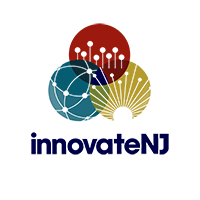 Please join the chat using the hashtag #innovateNJ. During the chat we’ll also share information about how other New Jersey school districts can join our organization. The next round of applications will become available this week. At the least, please join our chat on 11/20–we’re talking innovation! To view our Twitter chat invitation, click on the image. For chapter two, we used the discussion questions above in small groups to help everyone come to a better understanding of the chapter. Then, we got together to discuss each small group’s answers. One trick when reporting out answers in a large group is to assign each group a number and use a random sequence generator (like this) to select speaking order and make each subsequent group identify something new that other groups did not address. 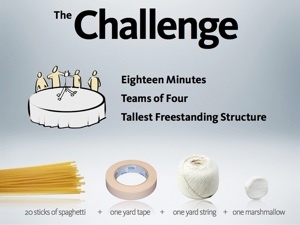 This obviously gets difficult as more groups present, but it is a great way to encourage deeper insight as each group will try to think of something unique to share with the large group during their discussions. For chapter three, we divided into eight groups and had about thirty minutes to create short visual presentations in the style of PechaKucha. PechaKucha is a relatively new presentation style that originated in Tokyo in 2003 and is designed to ensure people give short, visual presentations. The traditional PechaKucha model is 20×20–a presenter gives a 20-slide presentation and has 20 seconds for each slide. 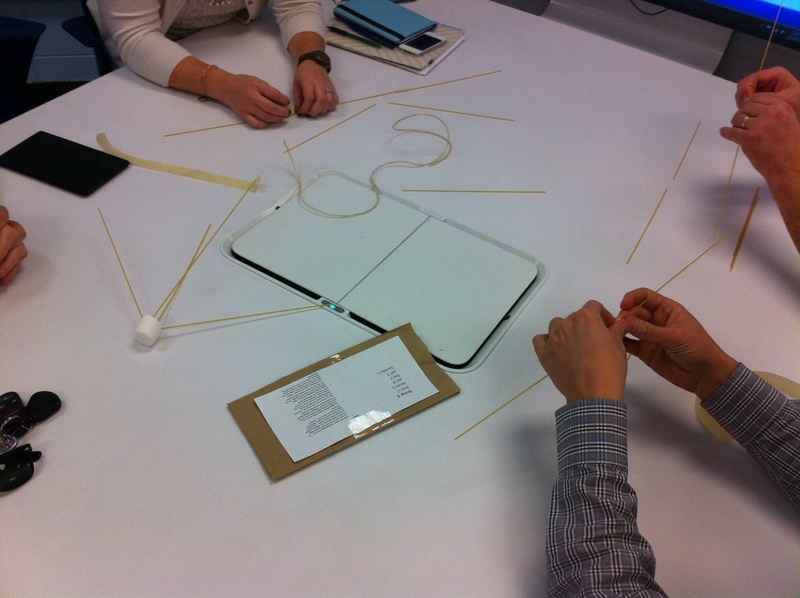 We modified the traditional model to a 5×1 where each group had to present 5 slides with about a minute for each slide. To make presentations go smoother, each group simply added their five slides to an already created presentation outline on Google Drive so we did not have to change files in between each presentation. This is a great tip for anyone who is looking to maximize class time and is sick of losing time to computer changes during group presentations. 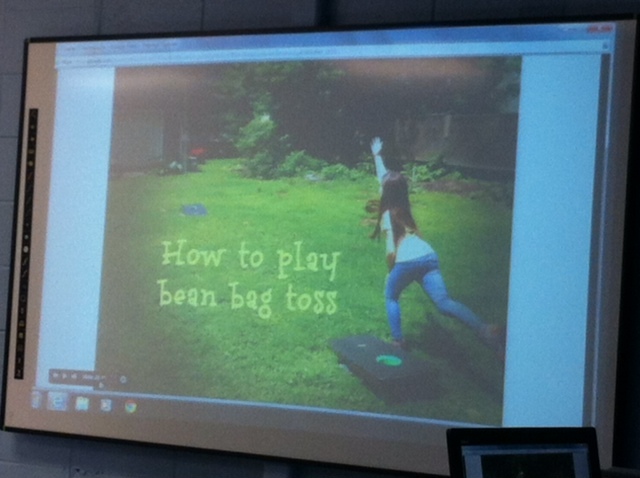 By having all groups add slides to a Google presentation, no changing of computers or files was needed. Another benefit of PechaKucha is that text is avoided in favor of images so presenters are more inclined to engage with the audience as they won’t be staring at a presentation slide. The PechaKucha from chapter three were fascinating, and since many of the topics have been addressed at various points throughout chapters one and two, they seem to be getting ingrained into our memories. 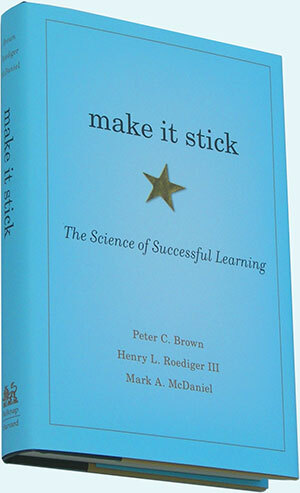 Throughout three chapters, Make It Stick has given us all a common language to discuss how we teach our students. As I visit classrooms, I see teachers encouraging students to write reflections about what they have learned in class and to predict what will happen next in a text or history –both are important lessons from the book. Our Big Read is already paying dividends. The best part? We still have five chapters to go! 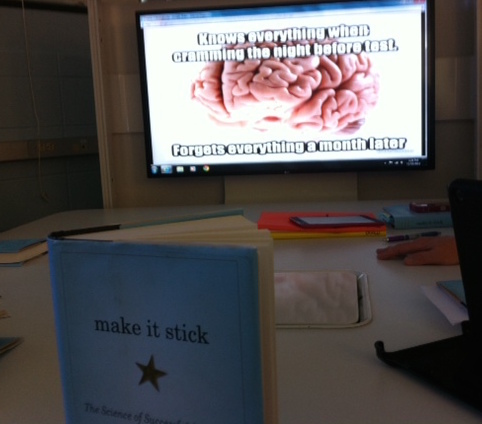 An image from a Make It Stick PechaKucha. It’s based on one of our favorite studies from the book, but I won’t give away the conclusion here!